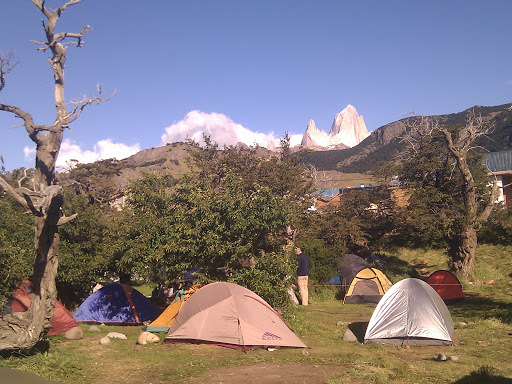 TandemThings: Sunday & Monday: El Chaltén at last! Sunday was a long tough day. One of our hardess days on the bike. It started out well enough; just as we finished breakfast the wind died down, and we had easy cycling in warm morning sun for the remaining 30 km of paved routa 40. Quite a contrast to how so many of the previous miles on that road had been. Great views over lago Viedma with the Andes and southern Patagonian icefield looming up behind it. Around lunchtime we bade farewell to r40 and joined the regional 23 that would take use the final 90km to El chalten. West. At first the headwind was what prior to this trip I would have classed strong, but now consider fairly tolerable. We made good process so were lured into setting our sites on getting to the town that evening. Of course, the closer we got, the more intense the wind became. All afternoon we crawled west, for ever towards the same mountains. The perspective distortion is startling: with each passing hour we would increasingly understand just how huge these mountains are, and hence just how very far away they were when we started. For the first time we had to stop and cook an evening meal, and they continue the final 20km to the town. As we turned slightly north to climb up into the glaciers national park it became clear the mountains were not going to afford any shelter from the gale, but instead they just funnel and hone it to always be a headwind, whichever way we'd turn. It's not a particularly high pass, but being able to cycle past glacial flows is really quite magnificent. It's a pity we were both so exhausted by this point as not to be able to fully appreciate it. The final descent (all be it one we had to work hard to achieve 5mph down) is even more magnificent. As the town appears, nestled at the foot of so many towering peaks like the most quaint of Austrian village, so too does the view of those mountains appear. When it became clear we would finally be able make it, we even managed to stop and grab a photo in the fading light. On waking Monday morning, we were greeted with a spectacular view of mount Fitz Roy, the distinct sheer granite slab that towers over the town. I managed to grab a quick snap before it was lost in cloud for the day. After doing washing and admin we learnt that they ferry on lago desierto is not running until tomorrow.evening, and the subsequent ferry over lake O'Higgins only runs Wednesday and then Saturday, which pretty much sets our agenda for the next couple days. Checked into a hosteria to get descent shower and good night's sleep before we head out for the remote border crossing into Chile, to join the Caterra Austral.